When you are in need of luxury but don’t want to break your budget, turn to A Plus Coach for world class Wedding Limo Boston and Party Bus Services. A Plus Coach of Massachusetts offers our clients superior Boston Wedding Limo Services at a fraction of the cost of our competitors. What better way to celebrate your big day then to treat yourself, your partner and guests to a luxurious wedding limo Boston. We have made it our life’s work to provide affordable and reliable ground travel to all of our beloved clients throughout Massachusetts. 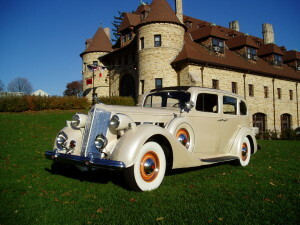 Antique Wedding Car– Our 1937 Packard Limousine is the very definition of romance. This elegant antique has an Ivory Pearl Paint and tan interior, it holds up to six passengers. This is a beautiful lead car and has several wedding packages including limousines and after reception sedans. Please call us to learn more about reserving this and our other classic cars for your wedding day. This car is a perfect match to our brand new stretch limousines, it has right hand British drive, beautiful leather interior with Walnut wood, tea trays and air conditioning. An Elegant lead car for any wedding, comfortably holds 3 guests and chauffeur. Our prized collection of beautiful, authentic antique wedding cars is ready for your special event in Scituate, the South Shore and Boston. Lincoln Town Car Boston – A Plus Coach offers exceptional executive town car service to a wide array of locations in the Massachusetts area. Boasting black leather seating, rear audio and climate control options and an extended cab for loads of legroom, this is the way to travel when it is just you and an extra couple of guests. This is where style and affordability truly come together in perfect harmony. Call 877-768-1700 to book your luxurious Wedding Limo Boston today. No matter the size of your wedding party, A Plus Coach’s Boston Wedding Limousine Services can handle it all. And we don’t just play host to weddings either. A Plus Coach specializes in a variety of events. We roll out the red carpet like none-other and take care of your every need. We are affordable as well. Here are just a few scenarios that you might consider when choosing to hire an affordable wedding limo Boston. Bachelor Parties and Bachelorette Parties – This is a night to cut-loose, if there ever was one. A Plus Coach offers the very best in Boston Wedding Limousine services to all those seeking a safe and spacious way to bar-hop with all of your friends. Why hassle with costly taxis and unreliable forms of transportation? There is no need. For a reasonable price we will pick up your whole gang and show you a night to remember.